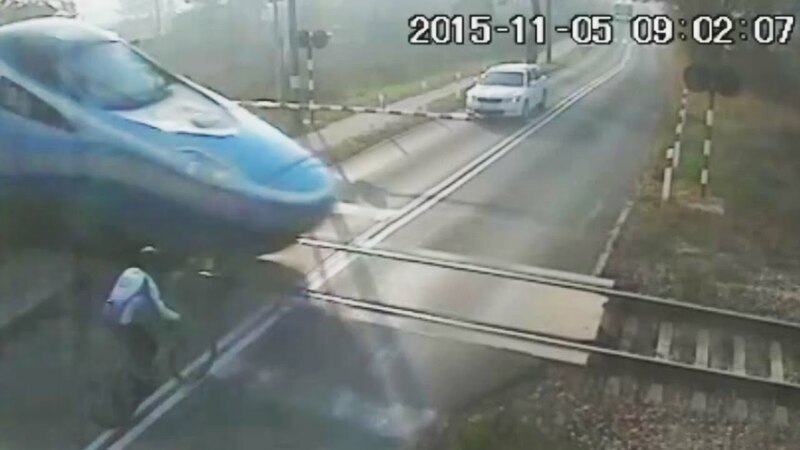 Traffic cameras captured a moment a 26-year-old Polish cyclist run straight into a high-speed train and got knocked unconscious after being tossed 12 feet. The heart-stopping video shows him going over the lowered barriers and sprinting towards the tracks completely oblivious to the Pendolino locomotive, which can reach speeds of 180mph. When the train suddenly cuts him off going somewhere between 80 and 90mph, the cyclist tries to break but it’s too late and he gets brutally body checked by the locomotive. A car driver who witnessed the incident run to help and ambulance was called immediately. The cyclist was taken to hospital but his injuries were not serious. I addition to getting bruised up, he was fined $140 by police for ignoring the red light, and the lowered barriers at the crossing. Worlds First Motorcycle Daimler Reitwagen.